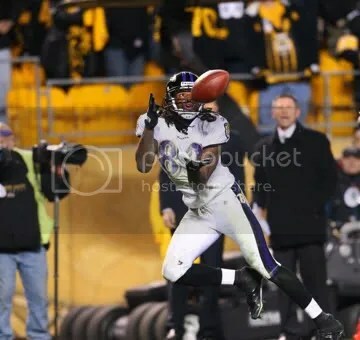 Chronologically, this is great memory #5 in our “Remembering the Regular Season” series, but I have a feeling it is #1 in the hearts of just about every Ravens’ fan. For the second consecutive year, Joe Flacco threw a final-minute touchdown pass at Heinz Field to beat the Steelers and send the yinzers home cryin’ in their towels. In 2010, his strike to T.J. Houshmandzadeh capped off a relatively short game-winning drive. This year, the odds were stacked even more strongly against late-game heroics – Joe and the offense took over at their own eight yard line with 2:24 on the clock, one timeout, and trailing 20-16. What Flacco did next earned him the distinction of “Drive of the Year” (scroll to the bottom) by the website ColdHardFootballFacts.com. Against their bitter rival, the Ravens trailed 20-16 with 2:24 left, one timeout, and needing to go 92 yards against one of the best defenses in the league. The often criticized Joe Flacco put a signature win on his resume with a near-flawless drive, throwing for all 92 of the yards, and overcoming some drops by his receivers. It’s an easy choice for Drive of the Year, given the ramifications it had on the AFC this season. Without the drive, the Ravens are likely preparing to go to Denver as the 5th seed right now, while the Steelers would have had the No. 1 seed, and home-field advantage over the Patriots and everyone else. For a season that produced many great comebacks, no drive had the kind of impact and degree of difficulty as Baltimore stunning Pittsburgh to complete a season sweep. Torrey Smith, whose holding penalty negated Ray Rice’s long touchdown run on the Ravens’ first offensive play, and who failed to tap his toes in the end zone a bit later, AND who dropped what should have been the game-winner earlier in the drive, redeemed himself by catching the game-winning score on their last play. It was an incredible win for the Ravens, and one that ended up being extremely crucial to their current status as the AFC’s #2 seed. Here are three great videos that every Ravens fan could watch on repeat for hours on end. This entry was posted on January 5, 2012 at 1:51 pm and is filed under Ravens, Ravens Season Review. You can follow any responses to this entry through the RSS 2.0 feed. You can skip to the end and leave a response. Pinging is currently not allowed.